There are times in life when it is HARD to maintain the pace... Right now my Big Girl job is all encompassing, leaving little time for much else. When I get home all I want to do is be with my family, nowhere near the computer and I have no desire run..
Me before the run, full of promise. 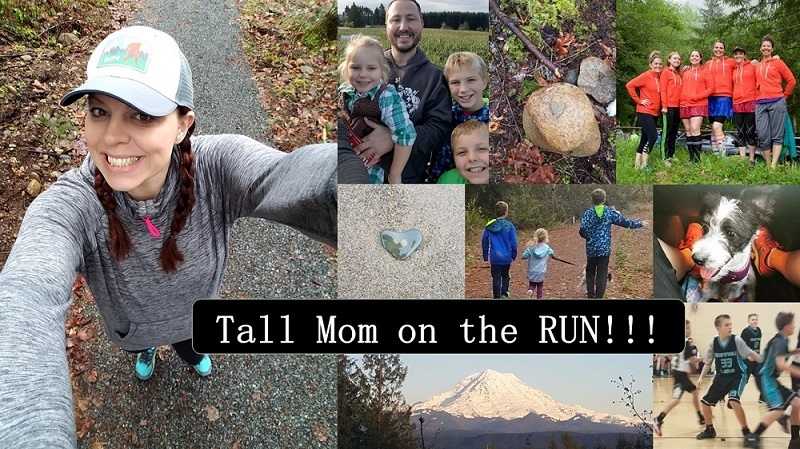 We ran quickly up a big hill then were hit in the face with wind, I realized that I could not breath and I was ZAPPED.. At 2.8 miles I had to walk, check my ego and tell Kerrie to go on without me. 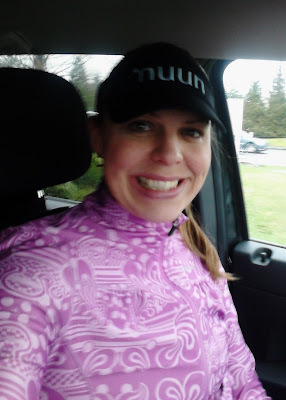 Kerrie was sweet and altered her workout to run slower with me. I had a horrible side ache and felt light headed. I struggled to maintain a pace in the 9's and was HAPPY when Kerrie and I parted so I could walk. Maybe I am coming down with something? Maybe I am totally out of shape after 1 week? Try not to stress about it. You probably just had one of those blah runs. Have a great weekend! I was going through a 2 month rut where I couldn't keep my pace to what it normally is. I started to only run when I wanted and didn't take my garmin. After a bit of doing this, I got back into my normal pace. My body just needed the rest and I was stressing about paces! I had to remind myself that I run because it's FUN, not to add stress to my life. :) YOu'll be back at it soon, don't worry! Time zones are hard. I think you're smart to take a break. You will be back and as strong as ever. Relax, sit back and enjoy the view! And have greek for dinner with some cool girlfriends! We all have times like these! Regroup and focus! I travel for my work and traveling really does take a lot of out you! I feel jet lagged (even when I don't change time zones) for a week afterwards sometimes. I was recently forced to take a week of and it was the best thing for me. Juggling everything can be very stressful and draining. Relax - don't worry about it. We run because it brings us "joy" (in a warped kind of way) - if it stops doing that - it's time to take a break. I just wrote an article for our local paper about time and balance. One of the things that you have taught us is prioritizing. You must take care of yourself and family before anything else. Sounds like you are making all the right choice. Hang in there. 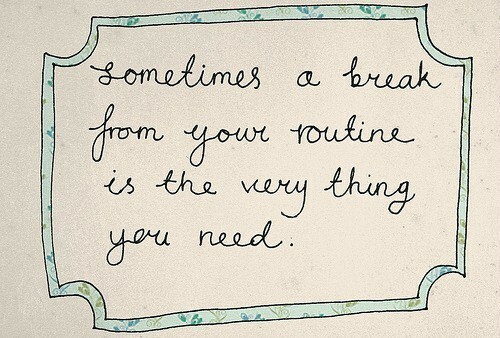 You've been working hard...you deserve a break. Family first definitely! I'm glad you can rest and take a break. All will be fine and we'll still be here when you get back. You are just awesome and honest. It's all good, Mel :) Breaks are good (speaking from the middle of mine!). It can be the hardest thing to do, but the smartest move in the end! We all have those days. Listen to your body. Spend time with your family. Sleep. Rest. We'll be here when you come back!!! First Demi Moore and now Tall Mom????????? Give yourself a rest. You deserve it!! I don't know how you do it. REST, REST, REST!! cars, planes, ect....as in helicopters, submarines, hot air balloons,...you know, all those normal modes of transportation. PS LOVE the new blog! Its amazing!!! Enjoy your break! Time to renew and refresh! You are so SMART and such a great example to listen to your body!!! Good on ya, sistah. You'll be back in a flash, and much stronger because you took a little down time. Breaks are awesome. 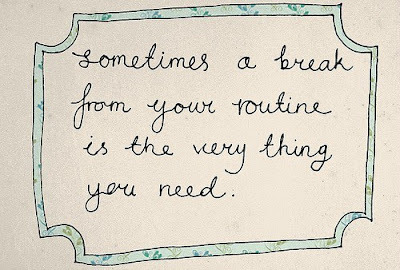 Don't worry about us, just give yourself a break, we will be here for you! !